Today's installment of Fedora Test Day will focus on GNOME 3. This is the first of three Fedora 15 Test Days focusing on GNOME 3. The goal of these events is to test as much as possible of the functionality of GNOME 3 to ensure that it works correctly and provides the necessary basic features for a day-to-day usable desktop. Remember, this ain't your momma's GNOME - the overall user experience of GNOME 3 is very different from GNOME 2. It's fine to ask about the changes and make feature requests, but before filing a bug on something that's 'missing' from GNOME 2, please ask in #fedora-test-day to make sure it's not an intended change. There should always be someone there who can answer your question. Thanks! An updated Rawhide (tips on installing Rawhide below), or the specific Test Day live image. For most testing, a graphics adapter capable of compositing: we are aiming to support all NVIDIA GeForce adapters, all Intel adapters except for GMA 500 (Poulsbo) and pre-i915 (i8xx) adapters, and all ATI/AMD Radeon adapters. If you are using an unsupported adapter, you can still help us with fallback testing - see below. Some adapters are known to be currently not working or problematic with the Shell. NVIDIA GeForce 400 series (Fermi / NVC0) adapters currently have no acceleration support and should fall back to compatibility mode (see the fallback testing section below). GeForce FX adapters may exhibit poor performance. Interaction may fail with GeForce 2 / GeForce 4 MX adapters, making the desktop effectively unusable. Virtual machines without 3D acceleration pass-through support will not be suitable for most testing: the Shell will not run in these configurations. Also, even though some VirtualBox editions have passthrough support, the current Fedora implementation does not support it, so Shell will not work in VirtualBox either. If you are using a virtual machine, you can still help us with fallback testing - see below. As this event comes before the release of Fedora 15 Alpha, you will need a Rawhide installation or live image to perform the testing. The live images for the Test Day are in progress. The x86_64 and i686 images are uploaded now, but please check the SHA256SUM is correct before booting! If you downloaded a nightly live image as linked from this page before the date of the Test Day, please discard it and test with the dedicated images linked below. You may download a non-destructive Rawhide live image for your architecture. Tips on using a live image are available at FedoraLiveCD. Note that these 2 images are not CD-sized so should be used either on a DVD or a thumb drive. If you want to try Rawhide, see the instructions on the Rawhide page on the various ways in which you can install or update to Rawhide. For now, you will also need to add a repository definition to /etc/yum.repos.d for the Koji Rawhide repo and update using that, as Rawhide proper does not yet have all the necessary packages. You may need to remove some packages for the upgrade to proceed, and you should remove at-spi2-atk and all packages ibus-* as they cause significant issues (crash when typing in any GTK+ 3 application including the Shell itself, and inability to type in dialog boxes) if installed. Using the live image is easier and highly recommended. Please perform as many of the test cases listed as you have the time and the resources to complete, and fill out your results in the table below. You do not need a Fedora account to fill in the table. This test case will test that GNOME falls back correctly to a 'classic' environment if your hardware does not support the GNOME Shell. If your hardware starts GNOME Shell correctly, please leave the fallback test column empty, and fill in the other test result columns. If your hardware is unable to start GNOME Shell, but falls back correctly to a classic environment, please mark the fallback test in the results table as 'pass', and leave the other test columns empty. If your hardware is unable to start GNOME Shell, and does not fall back correctly to a classic environment, please mark the fallback test in the results table as 'fail', file a bug against gnome-session, and leave the other test columns empty. As well as running the formal test cases, you can help simply by running GNOME 3 and reporting any problems you come across in the course of your typical use, even if they do not match up with any of the test cases. Please remember, though, that just being different from GNOME 2 is not necessarily a problem, and check in #fedora-test-day before you file a bug. If you have problems with any of the tests, try and report a bug. Most bugs in this event should be reported to GNOME Bugzilla. Bugs that are clearly issues in Fedora GNOME integration should be reported to Fedora Bugzilla. You will need an account to report bugs, but creating one is easy, and we will help you do this if you ask in IRC. If you are not sure of the appropriate component, please check in IRC before filing, there are many possibilities. If you are unsure about exactly how to file the report or what other information to include, just ask on IRC and we will help you. Once you have completed the tests, add your results to the Results table below, following the example results from the first line as a template. The first column should be your name with a link to your User page in the Wiki if you have one, and the second should be a link to the Smolt profile of the system you tested. For each test case, use the result template to describe your result, following the examples in the Sample user row. ↑ I'm not sure, but shouldn't pressing "," go one scene rewards? In case it should: it doesn't. ↑ Client works fine. Had to disable iptables for server to work. Shell overview mode doesn't work correctly over VNC. ↑ The "Date and Time" icon showed up twice, once as "Date and Time" and once as "Date & Time". Note the difference between "and" and "&". ↑ 1. /sbin/chkconfig sends an alert to SELinux if asked to update clock from network. ↑ 2. Vino server does not see or get connections. ↑ 3. even mounted my BeOS partition, but not my FreeBSD's. ↑ 4. bugzilla #674850 --Upgrade your system-- does not close. 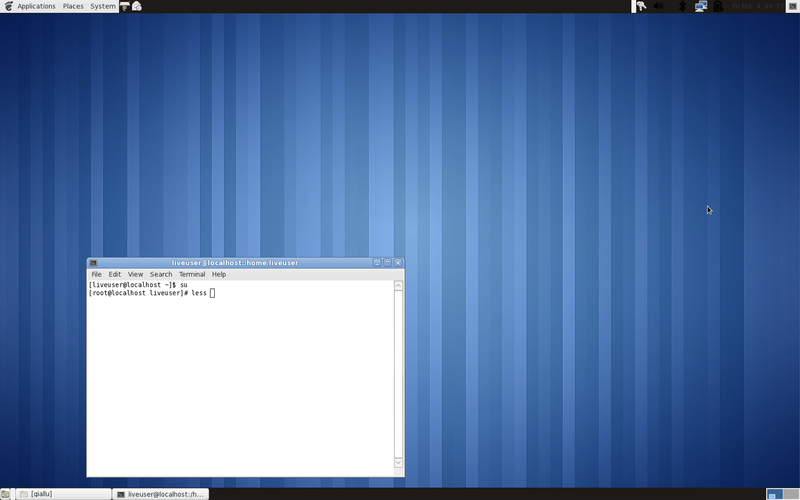 ↑ Small issue is that Gnome falls back but the theme is still Gnome shell so it makes the panel bars hard to view. ↑ Did not offer changing the preferred applications. ↑ Seems that enabling ntpd does not work properly. Had to manually "systemctl enable ntpd.service". ↑ Tried SD card but it could not find its partition name. ↑ Could not get display mirroring to work. ↑ Downloaded a PDF to ~/Downloads and search was not able to find it. ↑ Only worked for 1920x1080 other sizes produced grex box with x. ↑ Webm fwd / reverse does not work properly. Stops video, no way to resume. ↑ Only tested SD card. ↑ 15 apps in Dash makes their icons too small and hard recognizable. Session some time crashes while draging to workspace for open. ↑ Shows only icons, text is reduced and that's bad. Icons must have descriptions. ↑ Still offers evolution even when def. application is thunderbird. ↑ Most of the time all icons show up. Sometimes it appears that some component fail during GNOME start-up: some icons missing, GTK theme reverting to default, and the background is a solid black, but likely a settings-daemon problem. ↑ no visual feedback for mute (like vol-up and vol-down have), I also would expect that second press of "mute" button will "unmute" sound, but it doesn't. Pressing "vol-up" or "vol-down" does it. ↑ Test pass, but adding or removing a monitor was not detected automatically. Starting xrandr or gnome-control-center did a "refresh" and the change was seen by Fedora. ↑ Have a GeForce 6150SE nForce 430. OS apparently thinks 3D acceleration is working, but display is totally corrupted, so it isn't. Had same problem with mesa-drivers-dri-experimental in F13 and F14, so must use proprietary nVidia driver. ↑ The desktop's date and time configuration tool has no effect at all. The other two methods of date and time adjustment *do* work but no effect on the panel. ↑ This video hangs if seeked after half of it has played. Playing that one, Totem does not allow seeking at all (the grip moves while playing but not interactive). Multimedia Stop button does not stop but pauses videos. ↑ This should be a supported chipset, not sure why the Shell is not starting. Besides fallback mode looks weird. ↑ Searching with key on sintel-360p.webm file don't work. This page was last edited on 20 June 2015, at 01:44.